Bhutanese Prime Minister Dr Lotay Tshering on Friday expressed his keenness to further develop the existing trade relation with Bangladesh. “There are huge potentials to develop the bilateral trade further. The trade relation can be taken to a new height by effective communication and follow up,” he said while meeting with the business leaders of Bangladesh at a hotel here, said a press release. Federation of Bangladesh Chambers of Commerce and Industry (FBCCI) organized the meeting. FBCCI President M Shafiul Islam Mohiuddin presided over the meeting while Bhutanese Foreign Minister Dr Tandi Dorji and senior officials of the Bhutan government also attended. Prime Minister’s Private Industry and Investment Adviser Salman Fazlur Rahman and State Minister for Disaster Management and Relief Dr M Enamur Rahman also spoke at the meeting. 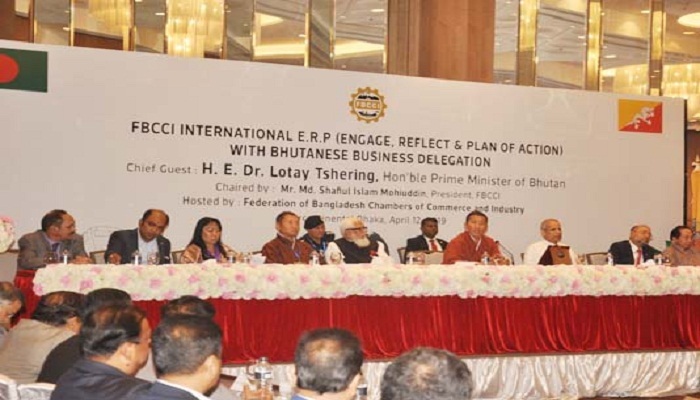 Bhutan Ambassador in Dhaka Sonam Tobden Rabgye, President of Bhutan Chamber of Commerce and Industry (BCCI) Phub Zam and a 26-member Bhutanese business delegation took part at the program. Shafiul Islam Mohiuddin emphasized on textile, ICT, construction and some others sectors to work with Bhutan. At the end of the programme, a Memorandum of Understanding (MoU) was signed between FBCCI and BCCI to set a ‘Joint Business Council’. FBCCI president and BCCI president signed the MoU on behalf of their respective sides. Representatives from construction, power and energy, hospitality and tourism and the Fast-Moving Consumer Goods (FMCG) sector from Bhutan participated at the meeting.